The company that is known today as Ariston Thermo Group was founded in the 1930's in Italy. The first Ariston water heater was made in 1960's. Today, Ariston brand is present in over 150 countries. The company designs and makes a wide variety of the heating appliances; from small residential boilers and water heaters to the large commercial burners. The company is also the owner of the following brands: Ecoflam, Thermowatt, Chaffoteaux, Elco, Racold and Cuenod. 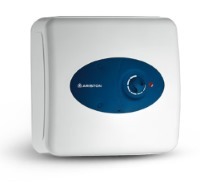 The most popular products used in water and space heating from Ariston group come from the gas-powered boilers that utilize on demand / tankless and condensing technology. In areas where gas heating is not a viable solution or is too expensive, Ariston offers models for electric and solar thermal heating or heating with the air-source heat pumps which are known for its high efficiency. The gas boilers are powered by natural or propane gas, and are grouped in three categories; combi boilers used in both water and space heating, system boilers that are designed for direct space heating and indirect domestic water when combined with the cylinders, and heat only boilers for domestic hot water production only. 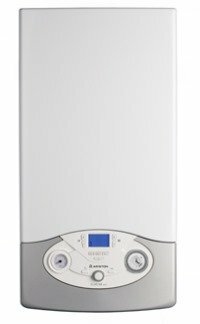 All three groups of gas boilers are wall-hung, have small dimensions and maximum weight of up to 36 kg, allowing easy handling and installation. The main features include the durable stainless steel heat exchanger and AUTO function, which guarantees the precise and enhance temperature control, providing great energy savings, improved efficiency and better comfort level. All the Ariston boilers are environmentally friendly due to the low NOX gas combustion and are very safe due to the several built-in safety sensors and devices. Ariston heat pumps are recommended for the homes where the gas delivery is not a viable solution and for those who are looking to reduce the electrical bill. The heat pumps are found in two sizes; both cylinder-type, and utilizing the surrounding warm air for water heating (air-source heat pumps). The main features and benefits include the extremely high COP efficiency, multiple anode rod protection, four heating modes and intelligent electronics with flexible programming and diagnostics. Classico HE and Aquabravo are two cylinder-type models which are floor standing and have the capacity up to 300 L (495 L) and warranty from 5 to 25 years (Aquabravo models due to the stainless steel tank). Floor standing models are equipped with the immersion type heating element, one or two coils and thermostat for easy temperature control.